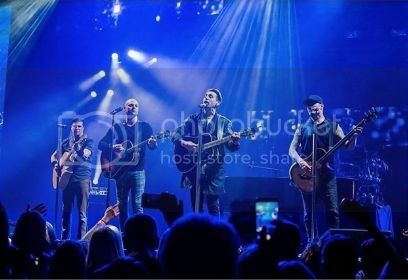 "Hedley's cross-country tour closed out a week ago, and it is being termed their biggest and best tour yet. The group's primary booking agent, Jeff Craib of Feldman Agency, tells FYI that just under 125k tickets were sold for the 27 stops, with an estimated gross of $7.5million." I was sure to send to my thoughts and what I overhead at concerts to AD. He couldn't say thank you enough. I think, even after the tour was over, they still needed to hear how successful it was. I also asked AD to thank whoever had the great idea of bringing back On My Own, Villian and Saturday even if it wasn't the entire songs. Until overhearing conversations and reading comments, I didn't realize how much Saturday meant to so many people, for many different reasons. It was definitely a highlight for me to hear those songs again. I completely agree about Saturday, it definitely made the show extra special for so many people. My own favourite oldie has always been Villain, so I was super stoked to hear that one live again. Never thought we'd see the day!